Walking a tightrope between deference and disrespect, James Franco has made his most ambitious work to date with “The Disaster Artist”, a seriocomic exploration inside the mind of writer-director-cultural sensation Tommy Wiseau. For the uninitiated, Wiseau is the auteur behind “The Room,” a ghastly melodrama about love, betrayal and tearing people apart. Since its 2003 release (it played for two weeks in L.A., so as to qualify for the Oscars), the movie has ascended into cult status. Dubbed the “Citizen Kane of bad movies,” Wiseau’s iconic creation continues to screen around the world to eager fans ready to revel in its distinct brand of badness. The origin story of Wiseau has always been a mystery. With the help of screenwriters Michael H. Weber and Scott Neustadter (adapting from the book by “Room” co-star Greg Sestero with Tom Bissell), Franco attempts to turn the myth into a man. And he’s mostly successful. Casting himself as Wiseau, Franco fully commits to the part. This is his “Ed Wood,” a behind-the-scenes look at the making of a movie no one — not even Wiseau — anticipated would be seen by so many people. Dodging the biopic trappings, Franco wisely casts the ancillary elements of Wiseau’s story. This starts with Sestero (Dave Franco), Wiseau’s longtime collaborator and best friend. The Franco brothers have yet to spend a significant amount of time on screen together during their careers. Having watched “The Disaster Artist,” it almost seems they’ve been waiting for a project like this to fall in their laps. The chemistry is present from scene one. Greg befriends Tommy after acting class one afternoon. Lacking in passion, Greg is in search of a dedicated scene partner. “You want to do a scene with me?” Tommy asks, incredulous. They become fast friends, two people who want nothing more in life than to spend their days doing make-believe. Aside from the undercurrent of pathos, it’s James Franco’s impeccable comedic timing that is the film’s ace in the hole. Obsessively preparing for the part, Franco mastered Wiseau’s vaguely European accent (his birthplace remains unknown) and staggered speech. No one speaks like Tommy Wiseau. Well, except James Franco. Without reducing or simplifying, Franco captures Wiseau’s genuine earnestness, his unbridled enthusiasm for moviemaking. As “Disaster Artist” proceeds, Wiseau’s lifelong desire to direct a feature film is granted. It’s here Franco calls in the cavalry to help re-create the inner workings of a dysfunctional set. 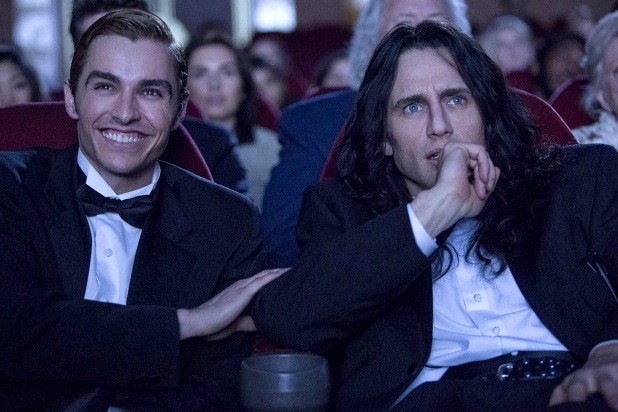 Everyone from Seth Rogen (also executive-producing) and Josh Hutcherson to Hannibal Buress and Zac Efron make appearances as actors and crew members on “The Room.” Miraculously, “Disaster Artist” avoids getting too busy with all these moving parts. The supporting players end up illuminating Wiseau’s eccentricity instead of undercutting it. This is a good movie about a bad movie that should be bad. But after attending the film’s anticipated SXSW premiere, one publication began speculating: “Is James Franco’s ‘The Disaster Artist’ Already an Oscar Contender?” Aside from being an absurd inquiry to pose in March — and a colossal misreading of the film and its intentions — the answer is, unequivocally, no. “The Disaster Artist” is not already an Oscar contender; it won’t ever be an Oscar contender. Franco’s film is not seeking attention from the Academy. In fact, the film’s demographic (youngish cinephiles, mostly male) is essentially the antithesis of the Academy’s voting body. What Franco & Co. have ultimately created is an endearing, if sometimes uneven, love letter to a man who has put his entire body and soul into the art. As Rogen and the Franco brothers were wrapping up their Q&A, the real life Chris-R from “The Room” (actor Dan Janjigian) came to the microphone. He wanted to take a selfie with the team, Wiseau included. Reluctantly, the “Disaster Artist” himself obliged. Even the most ardent detractors of selfies would have a hard time disparaging this interaction. It was, quite literally, a once-in-a-lifetime moment; the strangeness of the situation could not possibly be replicated. But both the film and its aftermath were confounding. Some of what unfolded that night doesn’t emotionally sit right. Were we laughing at Wiseau (who sat dead center for the entire screening) or with him? How does he feel about his real pain being transmuted into real (albeit really funny) comedy? Having seen the finished product, is he OK with a movie star’s depiction of him? For now, these are questions that will be left unanswered. Perhaps they are, without comment from Wiseau, unanswerable. In the coming months, time will tell whether “The Disaster Artist” has legs outside of festival fever. But regardless of its theatrical fate, what happened that night in Austin will go down as a singular cinematic experiences. It defied logic, trampled expectations, and redefined what it means to have a truly meta experience in 2017. And people say moviegoing is dead.